Last year, Arthur Topham, Canadian writer and blogger accused Canada’s powerful Jewish Lobby of creating country’s draconian Hate Law to target critics of Israel and the Jewish power. On October 27, 2015, Arthur Topham appeared in a British Columbia court to defend his freedom of speech rights. He is accused by B’nai B’rith of inciting hatred toward Canadian Jewish community (310,000 in country’s population of 35 million). BC province is home to 32,000 Jews. Topham is also accused of believing anti-Jewish ‘conspiracy theories’ like The Protocols, 9/11, etc. and re-blogging anti-Israel articles from other websites. If convicted, Topham will spend some time in a jail, in addition to a heavy fine and his website, Radical Press, would be removed from internet – like British vicar Stephen Sizer‘s personal blog 7 months ago. Terry Wilson, ex-anti-hate crime squad detective had accused Arthur Topham of quoting anti-Jew statements from Elizabeth Dillings’ book, The Jewish Religion: Its Influence Today. While cross-examining, Topham’s defense lawyer asked Wilson if he had read Ms Dillings’ book, he replied that he did. When further questioned that if he had cross-checked the book’s allegations with Talmud, Wilson admitted that he had never read Talmud. However, Wilson lauded Talmud as one of Jews “Holy” books and attempting to convince the Jury that any negative criticism of it was just pure anti-Semitism and hatred (here). 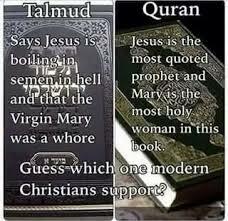 Israeli historian, late professor Israel Shahak in his epic book, Jewish History Jewish Religion, has exposed Talmud’s hatred of non-Jewish people, particularly hatred toward Jesus (as) his mother Saint Mary (as) and Christianity. Pope Francis, however, in an open letter published by Rome’s newspaper La Repubblica on September 11, 2013, defended Jewish scriptures, saying: Christians have rediscovered that the Jewish people are the holy root from which Jesus germinated. Holy Qur’an has dedicated an entire Chapter, Surah Mariam, in praise of Jesus (as) and his mother Virgin Mary (as). This entry was posted in Contemporary religions and tagged Jewish Lobby. Bookmark the permalink. Good luck Arthur! The Rothschild and Sassoon jews destroyed China 200 years ago with their opium and I had a website exposing this and it was sabotaged about 2 months ago. Gee, I wonder who did it? My life and my daughter’s life are in danger, so I’ve have been told or should that be, so I’ve been ‘threatened’? These people who call themselves ‘jews’ are no angels and are very powerful despite their small numbers and I say this having had several ‘close encounters’ with them.